*Discussing* the "Universal Cosmic Spirit", the "Vishwaroop" (Universal Form) and the Opulence of the Absolute. Thoughts on: the Ultimate Truth and the Purushottam Satya. Notes on: Satyam-Shivam-Sundaram; *why* Sanaatan Dharma is the 'eternal way of life'; the Śrīvatsa mark and the "Kaustubha" jewel; what the Siddha/Siddhesh/Siddheshvar/Ardhanarishvar/Transcendental Being (the concept of "self-realization") actually means; Sri Bhagavan's verses from the Srimad Bhagvad Geeta. *Why* the Krishna of the Mahabharat + the Srimad Bhagavad Geeta and the Krishna of the Radha-Krishna stories are NOT same? Three of our finest karmyogis: Samraat Chandragupta Maurya, Samraat Ashok and Samraat Chandragupta Vikramaditya. In Part-XXII and Part-XXIII we have talked about what the colours Red - Lohith/Lohitah/Rohitah; Blue - Shyam; Green - Hari-Hara/Prakriti; Golden-Yellow - Peet and Dark - Ghanshyam represent. These colours (i.e. various shades of these colours) - together - make up the cosmos. They represent the colours of the cosmos. 1. Colourful Chaos: The palette of pandemonium colors an interstellar cloud red, blue, and black as stars form within. 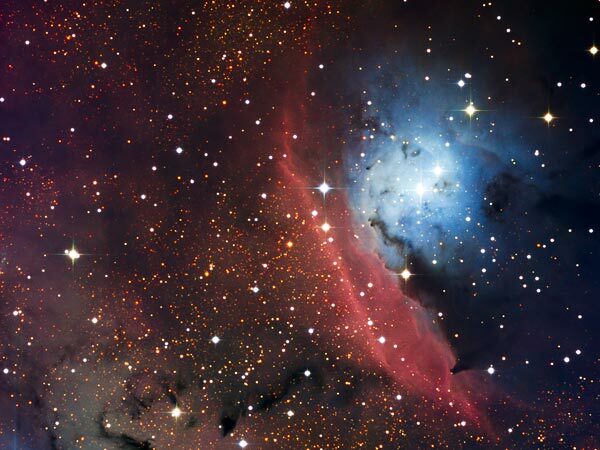 This image, captured by a telescope at the European Southern Observatory's La Silla Observatory at the fringe of Chile's Atacama Desert, shows a cloud of mostly hydrogen gas glowing red as electrons, freed by blasts of intense energy, recombine with the atoms. The blue area at right is reflected starlight bouncing off particles of dust. The dark splotches are regions where the dust is too thick for light to penetrate. 2. 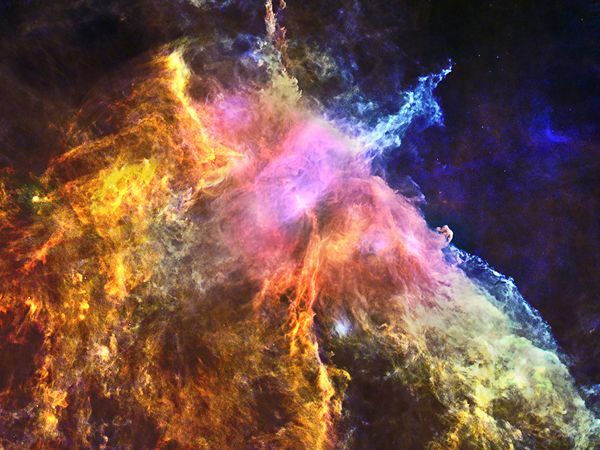 Flaming Nebula: Radiation from newborn stars heats up the Flame Nebula in the constellation Orion, some 1,300 light-years from Earth. The star illuminating the Flame Nebula would appear as another dot on Orion's belt but for the huge cloud of dust obscuring it from view and making it appear four billion times dimmer. 3. 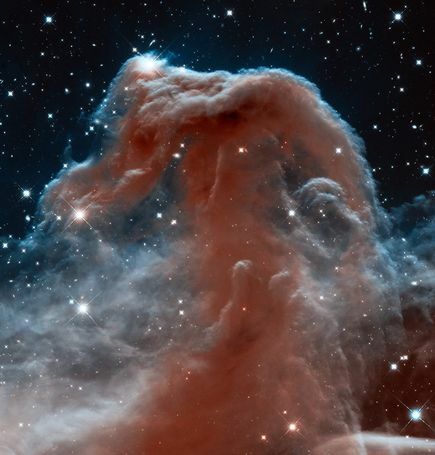 Picture of the Horsehead Nebula. [One of the avatars - an extension of the more famous "Dasavatara" - is the Hayagreeva (a figure with a human body and a horse's head). 4. 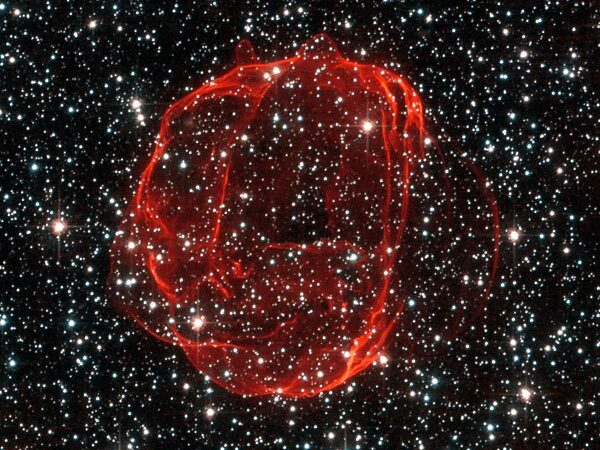 Supernova Puff: A thin shell of red gas is all that remains after a supernova explosion that occurred about six centuries ago. This wispy red veil was emitted by a former white dwarf, an older star that burned up all of its hydrogen and collapsed into itself. This ball of gas appears in the constellation Dorado, which also contains the Large Magellanic Cloud, a neighboring galaxy that orbits the Milky Way. 5. 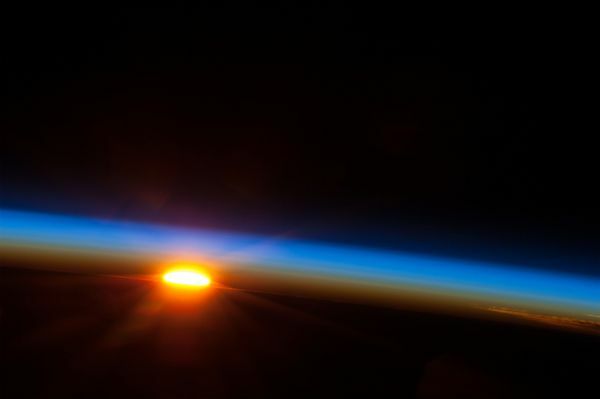 The sun rising over the South Pacific Ocean between 4 and 5 a.m. on May 5, taken from the Earth-orbiting spacecraft, the International Space Station, hovering a few hundred miles east of Easter Island. 6. 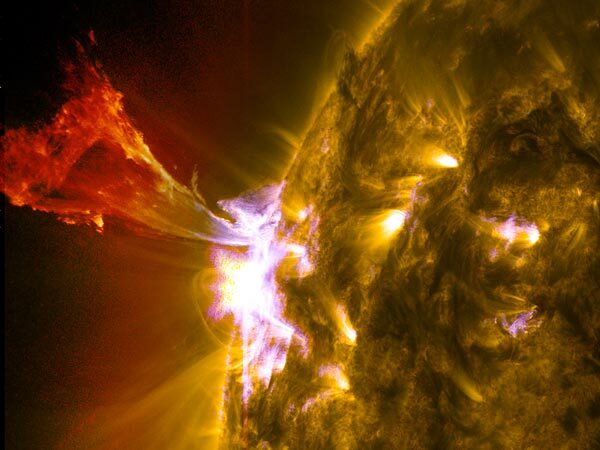 Solar Burst: Solar material dances on the sun. The splendour of the Absolute is indeed limitless, isn't it? 7. 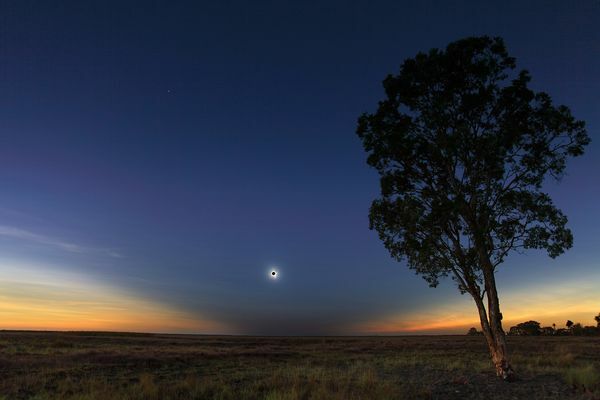 Disappearing Sun: Fleeting darkness blankets the Australian outback, as the sun appears blotted out by a total solar eclipse above Pormpuraaw, Queensland, Australia, last November. 8. 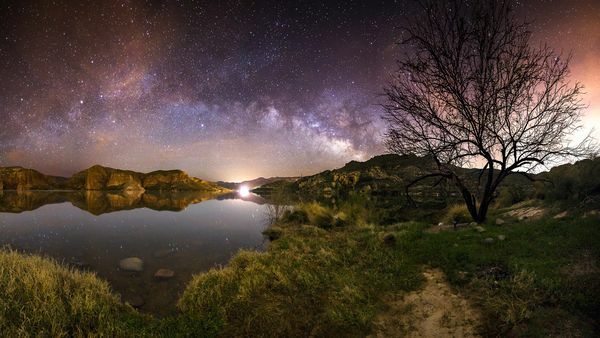 A tree beneath a starry sky: a lone tree appears to stand guard next to Canyon Lake, Arizona, under a canopy of stars. 9. A picture of Milky Way (Akash Ganga) above the Indian Ocean (Bharat-Mahasagar). Translated: Sri Bhagavan says, "Behold, O Paartha [O Son of Pritha], by hundreds and thousands, My different forms: celestial, varied in colours and shapes." The opulence of the Absolute is indeed infinite. Translation: "O mighty conqueror of enemies (addressing Arjun), there is no end to My divine manifestations. What I have spoken to you is but a mere indication of My infinite opulence." Translation: "But what need is there, O Arjun, for all this detailed knowledge? With a single fragment of Myself I pervade and support this entire cosmos." So, can we ever hope to grasp the opulence of the "Absolute"? Can we ever fathom the magnificence of the "Universal Cosmic Spirit"? Can we ever understand the magnanimity of the "Purushottam Satya"? Can we ever understand... what/who is the "Universal Cosmic Spirit"? Well, let's make a humble attempt. Joy and﻿ bliss flow in all creation. Day and night so much ambrosia surges in endless skies. 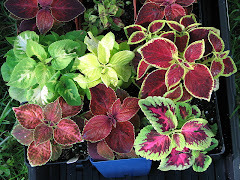 Earth is replete with life and light. Why are you sitting all on your own? Selfishly preoccupied for what reason? Look all around with an open heart. See how small is your sad little part. Fill your empty life with love. Robi Thakur also said: "mohabishwe mohakashe, mohakal-majhe, aami manab ekaki bhrami bismaye, bhrami bismaye..."
That he/humanity "roam in wonderment alone in this universe, in endless space and equally endless time." That: "Tumi aacho morey chahi, aami chahi tomaar paane..."
'Coz the "Vishwaroop" refers to the "Universal Cosmic Spirit" - the Cosmic "Purush-Prakriti" + the Purushottam Satya/the Lord of the Cosmos - appearing in a form that encompasses/incorporates the whole of creation/universe/cosmos in it. Therefore, there is no one form that signifies the "Universal Cosmic Spirit". It is as if: the Created and the Uncreated see each other... at all times. Robi Thakur, the veritable genius that he was, fully understood the workings of the cosmos. 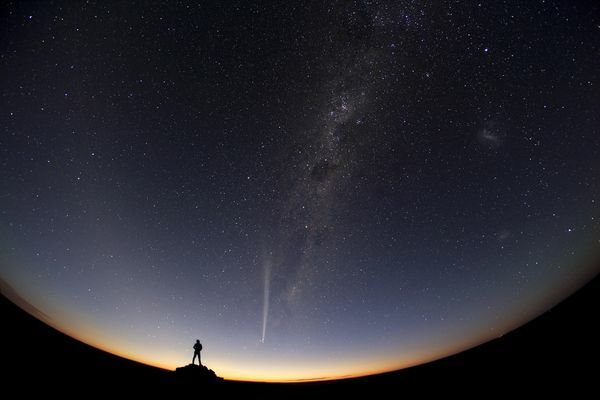 Hence he said: "Tumi aachho Bishwanatho oshimo rohoshyo majhe... nirobe, ekaki" - O Lord of the Universe, You reside amidst endless cosmic mysteries... in absolute quietude. "Apono mohima biloye" - Amidst the ocean of your own grandeur, You Muse. And he completely understood just Who the Satya-Sundaro/Satya-Sundar is. "In Ananda-lok, amidst auspicious glow (Mangal-aloke) resides the Satya-Sundar. Your majesty is manifest in the firmament complete. 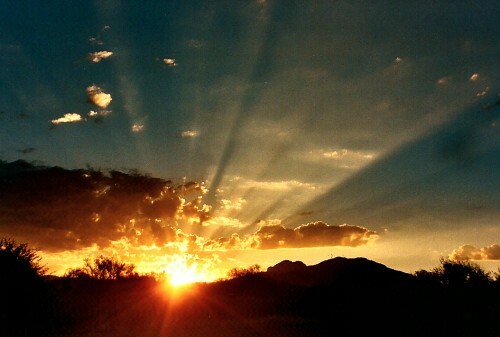 Creation's jewels are strewn at your feet." You who enclose all of this earth"
This prayerful song is on truth and beauty, on the bounties of nature and the splendour that this universe is. Most of what he wrote is sublime and none, I repeat: none... can even begin to try to translate what he so effortlessly expressed through this highly lyrical poem. Found in the Puja (prayer) section of the Gitabitan, this song was published by Robi Thakur in 1892. He was only 31 then. Robi Thakur would often experiment with a fusion of Indian traditional melodies set to European tempo and beats. 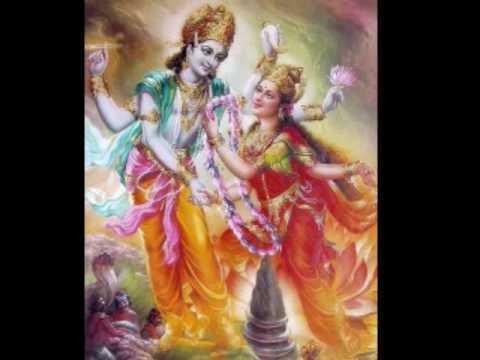 He had heard this bhajan (prayerful song) while on a trip to Mysore... and upon his return to Calcutta, immediately composed this amazing song set to an English waltz beat (1, 2, 3 1, 2, 3). The lyric of this song is a classic example of Robi Thakur's passion for merging Bangla words. The first two words are interesting: two similar sounding contracted words, but with entirely different meanings. Lok, meaning 'abode', has been joined with ananda while alok, meaning 'beam of light', has been coupled with mangal (auspicious). Sat-cit-ānanda: 'one who derives happiness through one's consciousness'. In other words: one who has achieved eternal bliss of self-realization, Sat-cit-ānanda (pronounced as: sach-chid-ānanda). Sat describes an essence that is pure and timeless; cit is consciousness; ānanda is absolute bliss. Now, which are the ananda-maya, cin-maya/eternal lokas (planets)? Answer: the eternal planets - the Vaikunth-loka or the Vaikunth planets. The answer is: The Purushottam Satya, the Satya-Sundar. At the end of the life-span of (each) Brahma [do refer: Part-XXIII], all the worlds (excluding Vaikunth, but including Brahmaloka/Satyaloka and the other Shiv-Loka/Kailash + the Devi-dham) are completely dissolved (maha-pralaya) - resulting in the balancing/preserving Cosmic Energy (also) known as Vishnu to go into the (metaphoric) 'big sleep' (ghum/maha-nidra). This (cosmic energy) Vishnu 'awakens' only after a NEW Shri/Lord Brahma appears/is created (after a day and a night of Brahma has elapsed or in other words: after 2 kalpas) - in order to take over the task of creation all over again. That is to say: to begin the cycle of creation all over again. This is the Ultimate Truth/Satya. Hence the first yug (of each maha-yuga or a four-yug cycle) is also known as Sat/Satya Yug. ... And the One who presides over this Ultimate Truth/Satya - this cycle of creation over and over again - is the Jagadeeshvar Ishvar, the tribhUvaneshvar, the Purushottam Satya, the Satya-Sundar: Virupaksh-Krishna - the oblique-eyed (Virupaksh) Lord of the Cosmos Himself. [Jagadeeshvar = Lord of the Cosmos. 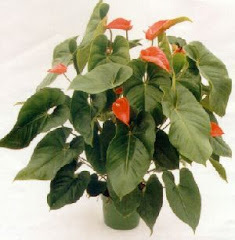 Jagad comes from 'Jagat' (which is a common term for: world/universe/cosmos). Eesh = Lord, Master. Jagadeeshvar = Lord of the world/universe/cosmos. ('Coz in Sanskrit: Jagat means all three). Jagadeeshvar also means: The Lord of the three Loka (Trilok). tribhUvaneshvar = the Lord of the three worlds (tri-bhUvan). The Three Worlds (tri-bhUvan) or the Three Loka [Trilok] are: 1. The Urdhva Loka (the Higher Planets). 2. The Madhya-Loka (the Middle Planets) and 3. The Adho-Loka (the Lower Planets). We - the earthlings... are part of the Madhya-Loka (the Middle Planets). Virupaksh means: the One with oblique-eyes. It also means: the One who sees everything. [Oblique-eyes is not to be confused for squint. In fact, in Bangla, (someone with) oblique-eyes is called 'Lokkhi-tyara'. Therefore, this Shri Vishnu is also known as Lakshmipati - the consort (pati) of Sri Sri Lakshmi Devi. This Shri Vishnu is Virupaksh - the One with oblique-eyes. He is also the all-knowing, all-seeing One. He does not have four arms though, that is imagery to indicate that He holds up the cosmos (in a manner of speaking, that is)... and keeps it running. We will discuss the cosmic troika: Satyam-Shivam-Sundaram - soon. And then, we (hopefully) can (to the best of our abilities) understand just who they are. Then, hopefully, we will also understand (to the best of our abilities, that is) just who the Satya-Sundar - Virupaksh-Krishna is. However: despite the cosmic troika, the Satya-Sundar is also the Satyam-Shivam-Sundaram. Robi Thakur, the amazing genius that he was, understood this completely. Hence he addressed his "Jana Gana Mana Adhinayaka Jaya Heye..." - now our National Anthem - to the "Bharata Bhagya-vidhata" - the "Universal Cosmic Spirit". He effortlessly merged the cosmic Advaita and the cosmic Dvaita. [To our ancients: the cosmic Advaita was the cosmic "Purusha-Prakriti" (the cosmic shankh/conch). While the cosmic Dvaita was the one 'holding' that shankh. The cosmos is shaped like a shankh, hence the shankha-dhvani - OM - is the primal sound, the sound of the cosmos/universe itself. It requires no external stimuli. Therefore: the cosmic "Purusha-Prakriti" + the "Purushottam Satya" together make up the "Universal Cosmic Spirit". The cosmic shankh, however, cannot be seen with mortal eyes. Translated: "Of letters I am the letter A (aksharanam a-karo 'smi), and among compound words I am the dual compound. I am also inexhaustible time (evakshayah kalo), and of creators I am Brahma." This clearly explains why the Satya-Sundar is also the Satyam-Shivam-Sundaram. He is also inexhaustible time (evakshayah kalo). He is Kalah personified [kalah kalayatam aham - among subduers I am time (Kalah). He is Kala, Mahakaal. "I am all-devouring death" - Srimad Bhagavad Geeta, 10.34. 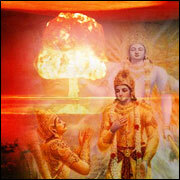 He is Svayambhu: "self-manifested", the Eternal-Uncreated Lord of the three Worlds (tribhUvaneshvar) - the Satya-Sundar. Translated: "Neither the humans (populating the Higher Planets - Devaloka/Svargaloka) nor the great sages (Sapta-Rishi) know My origin or opulence, for, in every respect, I am the source of all humans and sages." Translated: "Those who know Me as the unborn, as the beginningless, as the Supreme Lord of all the worlds (loka-maheshvaram) are alone free from illusion. Thus, they alone are Siddha (pure/perfected beings). [Here: all the worlds = Tri-loka, the three worlds (discussed above). 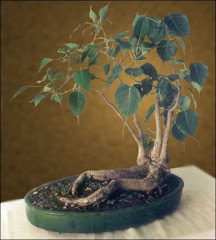 Maheshvaram = Maha-Ishvar. The Supreme Lord, the Param-eshwar. A Siddha: pure/perfected being - possessor of immense spiritual powers. A Siddha is someone who has achieved self-realization: the complete realization that everything is part of the "Universal Cosmic Spirit". Therefore, he/she is free from 'illusion' (moh-maya) of material attachment, etc. 'Coz he/she knows that everything in this cosmos/universe/world is transient - as part of His 'leela' (transient cosmic sport/past-time). ... Hope we are now (reasonably) clear as to why the Satya-Sundar is also the Satyam-Shivam-Sundaram. Robi Thakur truly was and remains the Universal Bard - the Bishwakobi. One of his most famous poems is Bharat-Tirtha ("India - the Pilgrim Center"). And this is not surprising. 'Coz ancient India (Bharatvarsha/Aryavarta/the land of the Aryas - much larger than what we know of today) mirrored the cosmos. ["Mirrored" does not mean literally. 'Coz the cosmos cannot be replicated in one planet or within parts of a single planet. "Mirrored" 'coz there were Svargalok/Devalok, Gandharva-loka, Brahmalok, Vishnulok, Shivlok/Kailash et al here too... and there were entities named Vishnu, Brahma, Shiv, Indra here as well. But none of them can be compared to their cosmic counterparts. The cosmos works very differently. All these entities on earth were independent entities. But in the cosmos... Vishnu is the one that creates the others (cyclically). So, "mirrored" has to be understood in that sense.] This great land is also the cradle of civilization. The Lord of the Cosmos Himself has arrived here several times... as part of His stated "...sambhavami yuge yuge". He has traveled all over ancient India. In Dvapar... He arrived in His most magnificent human avatar (form/roop) - as the Dvarkadheesh Krishna - the Shyamsundar, the Ghanshyam. [Do read: Part-XXIII - to know what Shyamsundar and Ghanshyam mean. Shri Krishna is inextricably linked with the sacred River Ganga as well as to the Sindhu-Sarasvati (the holy and mighty rivers - certainly, but also the Sindhu-Sarasvati Sabhyata - the civilization that flourished on the banks of these two rivers). Sindhu is part of our National Anthem as well, 'coz the whole of ancient India is Sindhu-Sarasvati Sabhyata. He is part of the Himalayas too. 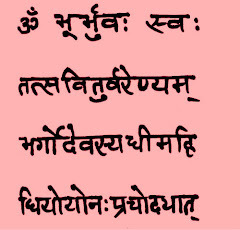 Translation: "Of the great sages (maharsinam) I am Bhrgu; of vibrations I am the transcendental OM (the Pranava Naad - the sound of primal energy, the sound of the universe itself). Of fire-rituals I am the chanting of the auspicious verses [japa], and of immovable things (sthavaranam) I am the Himalayas." ... And as we all know, the mighty Himalayan ranges "embrace" this great land. As for Shri Krishna and the Sindhu-Sarasvati Sabhyata... we will discuss that over the next few posts. Frankly: the knowledge resting within the pages of the Srimad Bhagavad Gita is very nuanced, many-layered; we have to deliberate deeply, carefully peel away the many layers - to drink deep from this fountain of wisdom and knowledge. It is, after all... the jewel of India's spiritual heritage. 'Coz the Srimad Bhagavad Geeta emanates from the mouth of the Lord of the Cosmos Himself, the one who embodies/manifests the "Universal Cosmic Spirit". The Srimad Bhagavad Geeta is the "Song of the Blessed One", the "Song of the Fortunate One". 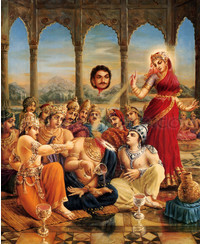 It is the Song (geeta, geet) of the One who is Eternal: who is both Mritunjay and Chiranjeevi. And Uncreated. The One who is keertiman and a karmyogi par excellence. The One who personifies karm (Nishkam Karm - selfless action) - whether in His purn avatar (actual form/roop) or in His many human manifestations (avatar/roop). The One without whom this cosmos will cease to operate or exist. The One without whom the Cosmic "Purusha-Prakriti" [the cosmic shankh] cannot "act" beyond a point. The One without whom everything will stagnate. The One without whom there will be utter chaos. The One who responds to the call of dharma (sacred duty). The One who is the defender of dharma: of Sanaatan Dharma/Arya-Dharma (the noble and eternal way of life). The One who is the protector of the defenseless; the One who upholds Kshatriya Dharma. The One who is Kshatriya-Shresht (meaning: 'the best amongst the Kshatriyas'). [Note: kshatriya is an amalgamation of two words: Ksat means injury, and tra means deliver. Hence a 'kshatriya' means: someone who protects others from harm, from adharm, and from aasuric or negative influences or entities - anywhere, and not just in the battlefield). The One who is Dharma (justice) personified. [Hence the symbolism of the mace. He is Dharma personified, 'coz He is just.] The One who is Compassion personified. The One who is truly Magnificent. The One who is immensely Bountiful. The One who is infinitely Magnanimous. The One who runs the universe. The One who is Achintya - unfathomable, beyond understanding, incomprehensible. The One who is Trikalagya: the Master of all things past, future and present (a bhuta-bhavya-bhavat-prabhu). The One who possesses the Tritiya-Nayan: the Third-Eye. The One who is the three-eyed-one. The One who knows what must be destroyed/subdued... for the cosmos to run and humanity (in all the loka) to progress well. The One who requests Arjun to become His instrument. The One who did not let utter destruction to engulf humanity. The One who did not let the destruction of Bhu-loka/Go-loka/Prithvi-loka/Martya-loka to materialize - despite the best intentions of malevolent forces/entities. 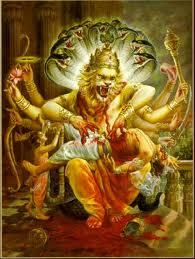 The One who is the saviour and protector of humanity (Narayan). And this is not limited to the humanity on earth... but to all the living beings populating the various planets (loka). Translation: "The seven great sages (the Sapta-Rishi) and before them the four other great sages (Sanaka, Sanandan, Sanatana and Sanat, collectively known as the four Kumaras) and the Manus [entities that arrive in all loka... during times of great calamity, distress and turbulence - pralay - in order to guide and resettle mankind, so that creation continues and the universe is kept running] come from Me, born from My mind (manasa, manasa-jata/brain-child), and all the living beings populating the various planets (loka) descend from them." So you see: The Srimad Bhagavad Geeta is the Song of the Narayan Himself. It is the Song of the One who embodies/manifests/personifies the Cosmic "Purush-Prakriti". It is the Song of the One who embodies/manifests/personifies the "Universal Cosmic Spirit" - the Brahmajyoti. 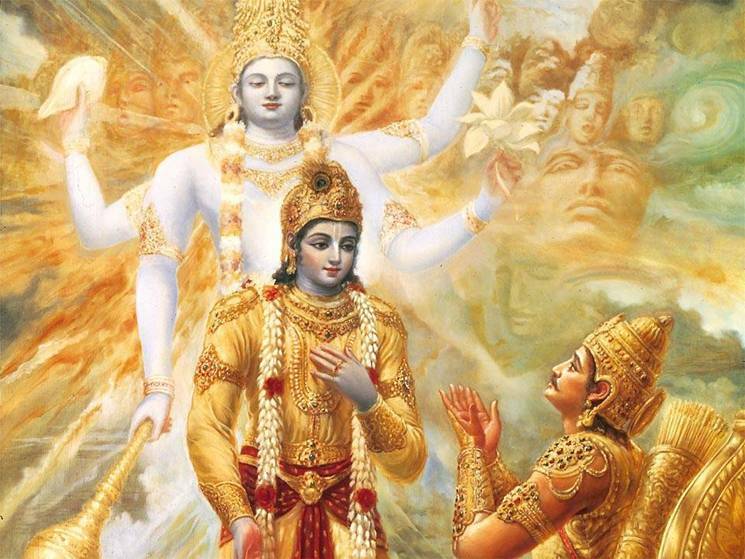 Thus: the Srimad Bhagavad Geeta is the Song of Virupaksh-Krishna, the Purushottam Satya, the eternal Satya-Sundar: the Lord of the Cosmos Himself. ... You get it, don't you? Robi Thakur rightly said: "amare tumi oshesh korechho, amon-i leela tabo" (tr. Thou hast made me endless). 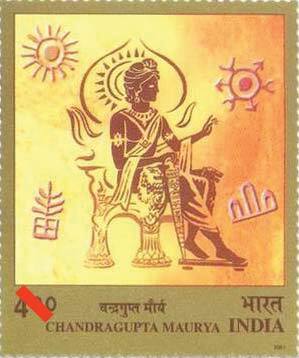 Hence he paid his humble obeisance to the Muses through his innumerable songs: Geetanjali - "song offerings". As he himself said: "gaaner bheetor diye jokhon dekhi bhubon-khani, tokhan tarey chini". He acknowledged (as only he could) that he has realized Him through his songs. That he has understood the endless cosmic mysteries... through music. To understand the three most important notions in philosophy (darshan-sastra): of harmony, balance, and integrity - Robi Thakur delved into the bottomless treasure-trove of the Upanishads, and these he imbibed. He let these ideas define him, not in the sense of limiting him, but lifting him up to meet the great Universal Cosmic Spirit... that he believed lay behind everything in the world/universe/cosmos, visible and invisible. Robi Thakur, the Universal Bard, a veritable colossus: multifaceted, sage personality of epic proportions, a genuine science enthusiast, a public figure of peerless eminence, a leader of thought, and an outstanding Upanishadic protagonist of India's lofty spiritual heritage... was/is the right person to share his thoughts and pay his obeisance to the Universal Cosmic Spirit. On his 152nd birth anniversary, all we can say is: aamar matha noto korey dao heye tomaar choron-dular porey. Heye Bishwakobi, heye Gurudeb, heye Moharothi, loho pronam. Shhoto-koti pronam. However, besides Robi Thakur, Rojanikanto Sen too understood the workings of the cosmos. Hence, this great poet and composer too paid his obeisance to the Purushottam Satya, the Satya-Sundar, thus: "Prabhu, Bishwa-bipado-honta, Tumi danrao rudhiya pontha..."
Note the brilliant manner in which this great poet has unified the Cosmic "Purusha-Prakriti" and the Purushottam Satya, the Satya-Sundar. The shankh and the shankh-dhar. Sri Bhagavan's verses have numerous layers. It is for us to delve deep into this treasure-trove of spiritual wisdom... and imbibe a mere speck of His Brahmajyoti (auspicious glow/mangal-alok). Therefore: the "Universal Cosmic Spirit" variously referred to as the Supreme Soul - the Paramaatma/the Supreme Being - the Parameshwar/the Brahman/ the Cosmic Energy/ the Ultimate Truth/the Ultimate Reality/ the Ultimate Knowledge or the Absolute... is simply the seamless blending together of the Cosmic "Purush-Prakriti" (the cosmic Shankh) and the "Purushottam Satya" (the cosmic Shankh-dhar: the Supreme Godhead, the Adi-Purush, the Jagadeeshvar - the Lord of the Cosmos, the Satya-Sundar). However: the Purushottam Satya (the Satya-Sundar) can also be regarded as the Param-aatma (the Supreme Soul/Spirit) as well as the Param-eshwar (Maha-Ishvar/the Supreme Lord, the Supreme Being, the Almighty). Robi Thakur's oeuvre is for all. For humanity. "This touch of Universal Reality - in land, in water, at all levels or spheres, the joy of not-so-obvious life - I would imbibe in my innermost being, in my entire body, in my blood stream, in my glances, in my voice, in all stages of my awakening and slumber, and in my meditation, on the beaches of the sea of ultimate rest, on my life's ultimate dusk." His essentially creative mind craved freedom from all kinds of shackles: "Ei akashe aamar mukti aloye aloye..."
... And he found this freedom amidst the limitless sky, amongst the infinite cosmic wonders. And then, we can fully understand the "Vishwaroop"... and why Sri Bhagavan says I (aham). The great Rajanikanto Sen also said: "Tumi nirmolo koro mangalo kore, molino mormo muchhaaye, Tobo punnyo-kiron diye jaak mor moho-kalima ghuchaye." Krishna means: all attractive. It also means "dark" - Ghanshyam (the all absorbing one. Why so? Do read: Part-XXIII). Kaali too means "dark" - Ghanshyam. Translation: "Among the Daityas (the Daitya clan - an offshoot of the Asura clan) I am Prahlad, among subduers I am time (Kalah), among animals (mrganam) I am the lion (mrgendro), and among birds (paksinam) I am Garuda." [Here "Garuda" refers to eagle, not Shri Garuda. Shri Krishna says He is Kalah (Supreme Time, the subduer). Meaning: He personifies Kalah. 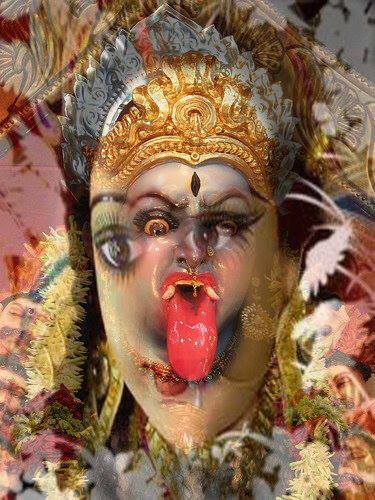 He is Mahakaal. But who do you think is Kaali/Mahakaali? Though Devi Chamunda is known as Maa Kaali, she is considered as a 'roop' or form of Devi Parvati/Durga. Therefore, while Shri Krishna personifies Kalah or Bhairav, Devi Durga/Parvati personifies Kaali or Bhairavi. But who is the Nrsinghi - the Lion-Woman? However, do also notice: "Trailokya-Traanna-Sahite" - the protector of Trilok (the three worlds or loka). Or in other words: the one who arrived to protect Trilok (the three worlds or loka). Ancient Bharatvarsha mirrored the cosmos. Hence, there were three loka here as well - in every maha-yug. However: the cosmic three loka or Trilok are: 1. The Urdhva Loka (the Higher Planets). 2. The Madhya-Loka (the Middle Planets). 3. The Adho-Loka (the Lower Planets). Now, think of the story about Shri Vishnu assuming the Mohini-avatar, so as to prevent the negative (aasuric) entities from laying their hands on the metaphoric amrit (celestial ambrosia). But then, there is no such thing as 'amrit' - celestial or otherwise. Amaratva (eternal life) can be achieved through karm alone, 'coz one's keerti lives forever. Plus: except for Virupaksh-Krishna there is no other eternal being with eternal life. Therefore: amrit here (possibly) is a metaphor for influence/power/resources et al. Or (maybe) all of them. And more. Vishnu (as Mohini-avatar) acquires the (metaphoric) pot of amrit from the thieving Asuras (by tricking them), and gives it back to the Devas, thus helping them regain their preeminence (euphemistically referred to as: immortality). Virupaksh-Krishna is also known as Mohan, and from this we can easily figure out the etymology of the word sammohan (the science of mind-control). The aasuric (malevolent) entities (residing in the Adho-Loka/the Lower Planets) indulged in negative activities/adharm (after attacking and occupying the higher Planets/the Urdhva-Loka, also known as Svarga-loka, Deva-loka). They also forcibly gained control over certain resources (euphemistically referred to as amrit)... that did not belong to them. And: all of this helped them to increase their influence/power tremendously. Result: huge imbalance - in the cosmos. Well, since these aasuric (malevolent) entities (residing in the Adho-Loka/the Lower Planets) knew about Virupaksh-Krishna, they would have (in all likelihood) been on their guard. It simply means Virupaksh-Krishna assumed a female form (opposite of Mohan) - as part of vinasaya ca duskrtam. He is a Master strategist, Soldier-Statesman par excellence [Part-XXII], Trikalagya, possessor of the Third-Eye/Tritiya-Nayan and a diplomat par excellence - at all times (as can be inferred from: 'Sudarshan Chakra' remaining in Virupaksh-Krishna, Mohini as well as Parvati/Durga's forefinger). His brilliance - referred to as the Sudarshan Chakra remains intact - irrespective of whatever outer coil He assumes. He truly is the Eka-shringa. The rarest of the rarest... not to be found anywhere else. [Eka-shringa is not an animal. 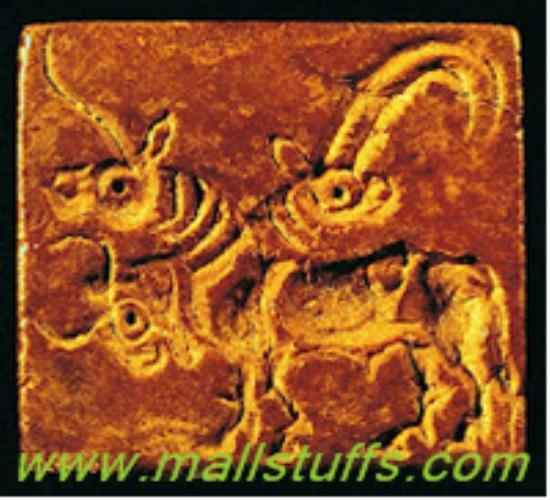 We will discuss the various symbolism associated with the Eka-shringa in our next post. However, it is unlikely that He would have gone around proclaiming who He is; He does not come across as boastful, He comes across as wise, discerning, firm and decisive [E.g., Saalva (armed with extremely destructive weaponry) tried his best to destroy Prithvi-loka, Krishna decided otherwise. And as He said: His will (Loka Sangraha or Loka Kalyana) is Supreme. Hence, He is the Supreme Balancer, the Supreme Preserver. He also knows how to overcome obstacles.] The current version of the Mahabharat (and even the Ramayan) is a much-copied-and-infinitely-embellished version (with various misinterpretations + tweaking + 'contemporisation'). He would have revealed himself only towards the end, while talking to Arjun, etc. These Sura/Devas are far advanced beings residing in the Urdhva-Loka (the Higher Planets). While these Asuras (malevolent beings) reside in the Adho-Loka (the Lower Planets). Not that Prithvi-loka has remained immune from the machinations of these malevolent entities. Even then: Shri Krishna was there... to protect Prithvi-Loka (and humanity). Thus: Both (Shri Krishna and Devi Parvati) are referred to as the protectors of the Cosmic Trilok). 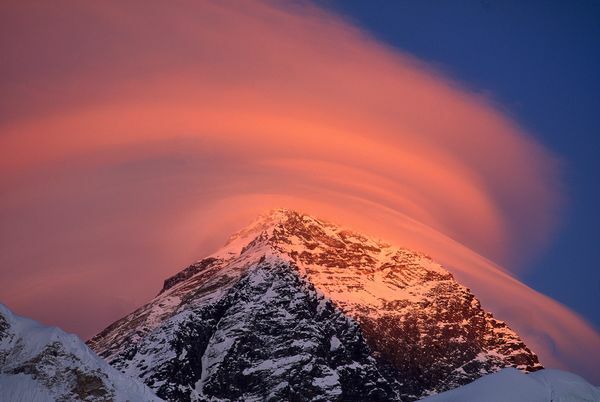 Even the Himalayas are associated with both. Virupaksh-Krishna is also referred to as "Narayan", while Parvati/Durga is constantly referred to as "Narayani". Narayan means the benefactor of humanity. And this is not limited to the humanity on earth... but to all the living beings populating the various planets (loka). Both acted as balancers and preservers of the cosmos and of humanity. Virupaksh-Krishna is the Adi-Purush. Devi Durga/Parvati is the Adi-Parashakti. Virupaksh-Krishna is called the Jagadeeshvar - the Lord of the Cosmos as well as the Jagat-Pita (the Universal Father). While Devi Durga/Parvati is revered as the Jagadeeshvari - the Lord of the Cosmos as well as the Jyotirmayee Jagan-Mata/Jagat-dhatri (the Cosmic/Universal Mother). 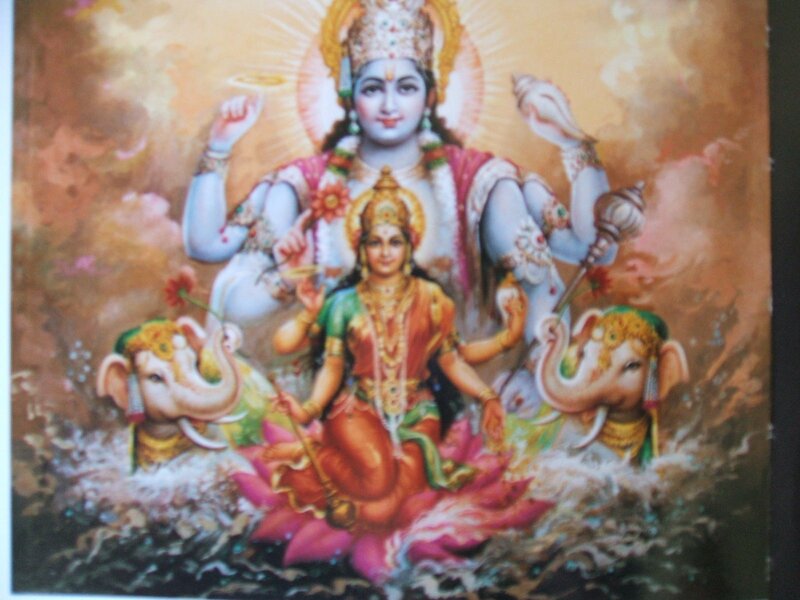 Vishnu is the Maheshvaram/Maha-Ishvar: the Supreme Lord, the Param-eshwar. While Parvati/Durga is the Maaheshvarii/Maha-Ishvari/Param-eshvari. So: were Devi Parvati/Durga and Shri Krishna one and the same? As part of the Lord of the Cosmos' periodic appearance/arrival (albeit in human form/incarnation/avatar) as per: "...sambhavami yuge yuge"? We have been discussing the "Dasavatar" as part of this series, and it clearly points towards the evolution of this planet + the evolution of life on this planet. For now, we will stick to Virupaksh-Krishna. And to Parvati/Durga. 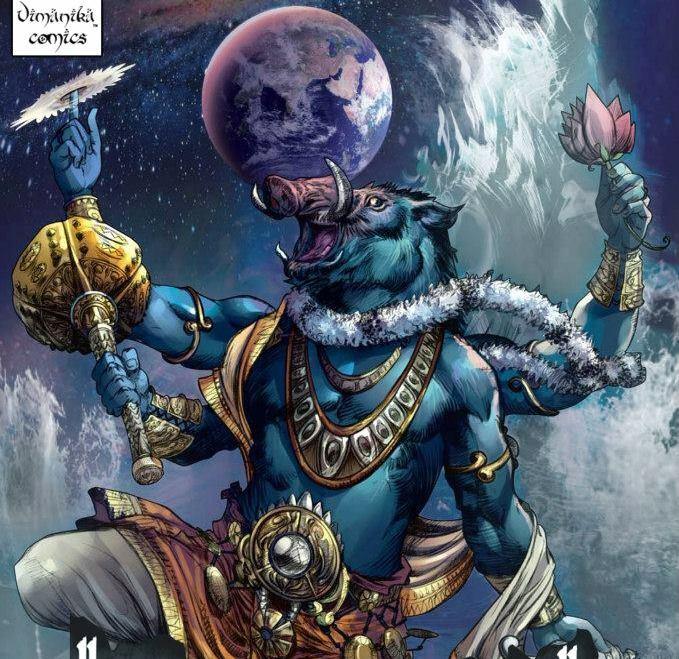 The first four "avatars" of the "Dasavatar" are: the Matsya (fish) Avatar, the Kurma (tortoise) Avatar, the Varaha (great boar) Avatar and the Narasimha (lion-man) Avatar. Though Devi Varahi is a different entity, she is considered as a roop or form/manifestation of Devi Durga/Parvati. 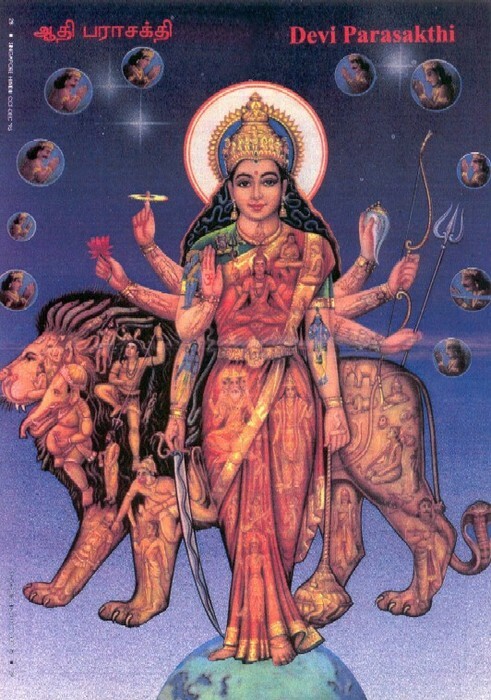 Which makes: Durga/Parvati... the Varahi - the female boar. Hence: were Devi Parvati/Durga and Shri Krishna one and the same? 'Coz in Sanskrit there is no gender-related or gender-specific reference. And: as we all know, the soul has no gender. [We will, of course, discuss the symbolism of the bull (vrishabha, vrisha uttamam - the Vrishni connection is very clear, isn't it? However, the amount of misinterpretation + tweaking of the narrative leaves one speechless), the boar (varaha) and the unicorn (eka-shringa) in greater detail - in our next post. Besides: the symbolism of the conch (shankh) and the Sudarshan Chakra (in some more detail). Translation: "Of all Siddhas (pure/perfected beings, possessor of immense spiritual powers) I am the sage Kapila (kapilo munih)." But Devi Parvati is Devi Siddheshwari. She is also Siddhidatri (the bestower of all Siddhis); she is depicted holding the Shankh (Conch-shell), Chakra, Mace (Gada) and Lotus (Padma) in her four hands. She is seated on a lotus flower with the lion as her mount (vaahan). Devi Siddhidatri is the Goddess/devi/diety who possesses and bestows all type of Siddhis on her devotees. Lord Shiva received all Siddhis by the grace of Devi Siddhidatri. 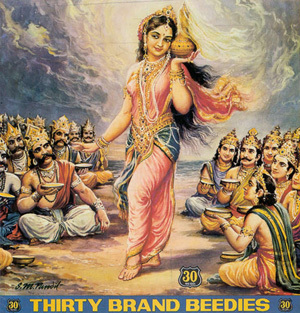 Devi Parvati is Devi Siddhidatri. Maa Siddhidatri is the ninth form of Devi Durga (Parvati) worshipped on the ninth or final day of Navratri. 'Siddhi' is a Sanskrit term which means 'perfection'. Devi Siddhidatri is depicted with four arms. She holds a Chakra in her right lower hand and a mace in the upper. In the left lower hand there is a conch-shell (shankh) and in her upper left hand a lotus flower. She is seated on a lotus flower with the lion as her mount (vaahan). Lord Shiva received all the 26 'siddhis' by worshiping Maha Shakti (manifested by Devi Parvati, who also represents Maa Adi-Parashakti and Maa Siddhidatri). By Her grace, Shiva became a 'Siddha', and thereafter came to be known as 'Ardhanarishvar'. 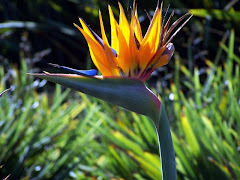 The Siddhi that She bestows helps in self-realization: i.e. the complete realization that everything is part of the "Universal Cosmic Spirit". Apart from all this: we also know that She responded to the call of Dharma. [Part-XXII.] While (the mortal) Shiv and Vishnu (despite being tremendous warriors) hesitated and did not. Also: Shri Krishna's words and deeds are titled: Srimad Bhagavad Geeta and the Bhagavad Puran. While Devi Durga/Parvati's deeds are titled Devi Bhagavatam and Devi Mahatmyam (the Magnanimity of the Devi). Red - (Lohith/Lohitah/Rohitah/the first 'avatar' was the matsya or fish avatar/Rohu, hence Shri Vishnu is also known as Rohit/Rohitah, meaning: red), Blue - Shyam, Green - Hari, Golden-Yellow - Peet and Dark - Ghanshyam... represent Vishnu-Krishna or Virupaksh-Krishna. Red - (Lohith/Lohitah/Rohitah - it also represents the power of Devi Durga/Parvati), Green - Prakriti (remember 'Ardhanarishvar'? Shiv (humanity) cannot survive without Prakriti (represented by Devi Durga), Golden-Yellow - Peet/Gauri, Blue - Shyam and Dark - Ghanshyam... represent Durga/Parvati-Kaali/Chamundi. So, what can we infer from all this? Kapil Muni's students built the city of Kapilavastu. Kapilavastu means: the substance of Kapila. Much later, in the current yug (Kaliyug), Bhagavan Shri Gautam Buddh lived and grew up in Kapilavastu for the first 29 years of his life. [Incidentally: even Pataliputra owes its origin to Shri Krishna. Though the city (even then a premier city of the land - at that time) was inundated by flood later on. Megasthenes, the Greek Ambassador in the court of Chandragupta Maurya, states that: the city of Polibrotha (Pataliputra) was founded by Herakles, 138 generations before the reign of Sandrocottas (the Greek name for Samraat Chandragupta Maurya). Herakles or Hercules is none other than Shri Krishna. When Alexander confronted Parvateshvar (Paurav/Puru/Porus) on the banks of the River Sindhu, Puru's soldiers were carrying an image of Herakles in their vanguard. They exchanged ambassadors with Indian kings and one such ambassador was Heliodorus who was sent from Taxila to the court of King Bhagabhadra at Vidisha (Besnagar, central India). On his visit to Vidisha, Heliodorus erected a Garuda-pillar in the honour of his 'God of Gods' Krishna. The Śrīvatsa mark is on His chest, symbolising His consort Sri Sri Lakshmi Devi. 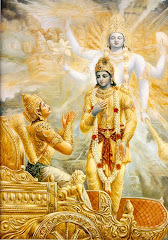 Vishnu is thus Srivatsankita, the one who bears the sign of Srivatsa. [Srivatsa (the beloved of Sri) is an ancient auspicious symbol in India. It is a mark on the chest of Vishnu where His consort Sri Sri Lakshmi Devi resides. It is also a mark of His immortality.] 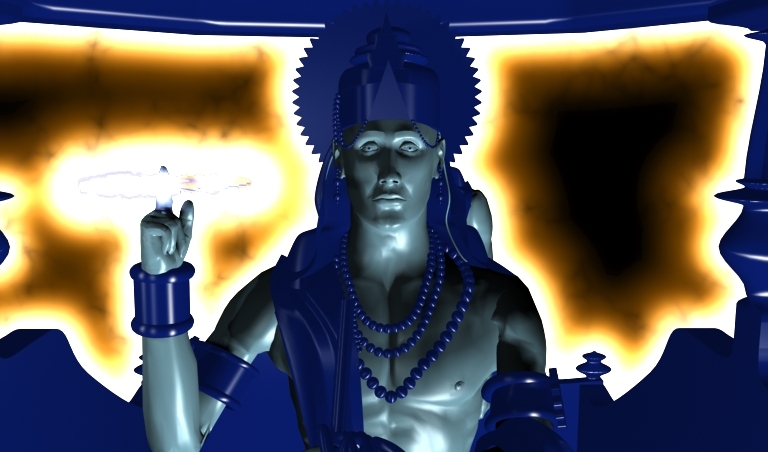 It is said that the 10th (and final) avatar of Shri Vishnu (in the current maha yug or four-yug cycle), Kalki, will be the bearer of the Srivatsa mark as well. 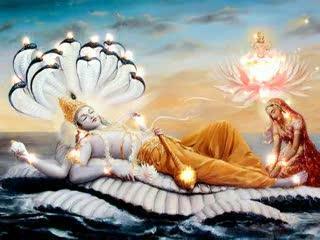 [SrivatsavakshaaH is another name of Shri Vishnu. The Śrīvatsa mark also adorns the images of the Jain Thirthankaras and of the Buddha as well.] Shri Vishnu also wears the auspicious "Kaustubha" jewel around his neck. Sri Sri Lakshmi Devi dwells in this jewel, on Vishnu's chest. The "Kaustubha" jewel also represents consciousness, which manifests itself in all that shines: the sun, the moon, the fire and the speech. Thus it represents consciousness, the consciousness of all living things. 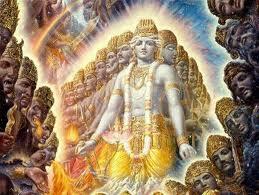 Shri Vishnu also wears a garland of five rows of forest flowers of different hues (vanamaalaa). Vaijayanthi (garland of victory) is a garland of five rows of jewels or five elements (bhuthas) that also adorns Shri Vishnu. There is no Sri Devi and Bhu Devi either. These are just different names for Sri Sri Lakshmi Devi. Devi Lakshmi is the symbol/deity/goddess/devi of wisdom, wealth and prosperity in the Indian pantheon. "Sri" and "Bhu" indicate wealth, wisdom, happiness and prosperity. [Among all the Samraat-s and Raja-s, only two: Shri Ram and Shri Krishna have been ek-patni. The Krishna of the Mahabharata + the Srimad Bhagavad Geeta and the one that arrived when Saalva attacked Prithvi-loka... are one and the same. However: the Krishna of the 'Raas-Reela' is a product of the Bhakti Movement and of Jayadev's "Geet Gobind". This Krishna is a different person... and is worshiped just as Sri Chaitanyadev is worshipped. This Krishna is regarded as 'avatar' of the Shri Krishna of the Mahabharat/Srimad Bhagavad Geeta just as how Sri Chaitanyadev too is regarded as 'avatar' of the Shri Krishna of the Mahabharat/Srimad Bhagavad Geeta. ... A la how Tulsidas is regarded as 'avatar' of Maharshi Valmiki. A cursory look at His life (in His Krishna-avatar) is enough to confirm this. He plays the flute, but does not dance (at least not how we think). When He 'dances', He is on top of it; it's child's play for Him. Also: it is said that He married Jambavani. Now Jambavan was a part of Treta Yug, Krishna was part of Dvapar. His "dark-complexion" is thus metaphoric, not literal. Hope we are reasonably clear on this. The amount of tweaking, misinterpretation and misunderstanding... coupled with multiple narratives fusing together... boggles the mind and renders one speechless. :) But then if the proverbial 'trial by fire' (agni-pariksha) that Siya-Ram underwent... could be 'interpreted' literally, what can one say? Also: one finds pictures of Devi Durga/Parvati bowing to Shri Vishnu. But then, both are one and the same! So you see? Frankly, Shri Vishnu is nothing like us... mere mortals/humans (of Martya-loka/Prithvi-loka). He is an extremely luminous eternal being, an entity that has created the cosmos and everything within it. He is also the One that runs it. The technology, knowledge, vision, wisdom, power et al at His disposal (and He is the Creator of all of these) are astonishing indeed. Yet, in his human avatar(s) He rarely uses them... preferring to achieve the tasks through karm instead. He is a karmyogi par excellence; He uses His power for the greater good - for Loka Kalyana or Loka Sangraha. That is: for the welfare of the world/universe/cosmos. Virupaksh-Krishna's ability to assume different mortal coils (based on the situation) is amazing indeed. This also contributes towards making Him a transcendental being. 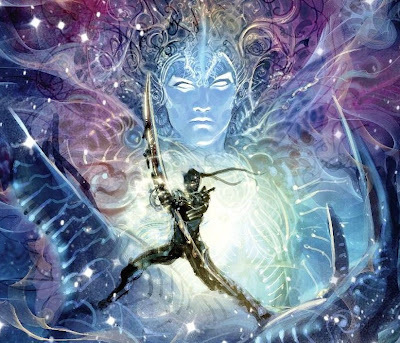 Greats such as Samraat Chandragupta Maurya and Samraat Chandragupta Vikramaditya truly understood Vishnu-Krishna's "Vishwaroop" as well as His human avatars. They imbibed a speck of His Brahmajyoti. They were true karmyogis. Result: this great land was at her pinnacle, resplendent and prosperous... and there flourished a just/inclusive society (euphemistically known as: "Ram-Rajya"). Later entities (sadly) did not understand Vishnu-Krishna at all. Hence they reduced Him to stage-plays with tweaked narratives, exaggerated body language and bombastic dialogues. In short: Nautanki. Or they went overboard with excessive 'Bhakti' and misinterpretations. Result? A person's karma consists of the action they take relative to their duties, called dharma. 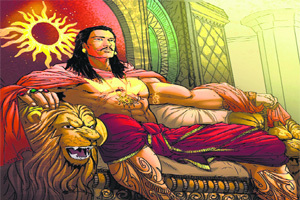 Samraat Chandragupta Vikramaditya upheld Raaj Dharma. No wonder his rule is often referred to as the Golden Age of India. 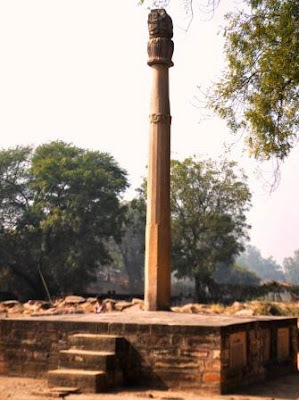 The Iron Pillar put up by Vikramaditya bears an inscription, which states that it was erected as a flagstaff in honour of Shri Vishnu, and in the memory of Chandragupta II (Vikramaditya). The pillar also highlights ancient India's achievements in metallurgy. This iron pillar is similar to the pillars of Samraat Ashoka. The pillar, with an idol of Garuda at the top, was originally located at a place called Vishnupadagiri (meaning "Vishnu-footprint-hill"), identified as modern Udayagiri, situated in the close vicinity of Besnagar, Vidisha and Sanchi, towns located about 50 km east of Bhopal, in central India. Vishnupadagiri is located on the Tropic of Cancer and, therefore, was a centre of astronomical studies during the Gupta period. The Iron Pillar served an important astronomical function, in its original site; its early morning shadow fell in the direction of the foot of Anantasayain Vishnu (in one of the panels at Udayagiri) only in the time around summer solstice (June 21). The creation and development of the Udayagiri site appears to have been clearly guided by a highly developed astronomical knowledge. Therefore, the Udayagiri site, in general, and the Iron Pillar location in particular, provide firm evidence for the astronomical knowledge in India around 400 CE. Pictures: 1-9: The opulence of the Absolute. 10-11: illustrating Robi Thakur's words; Illustrations of: Purushottam Satya - the Satya-Sundar; Lakshmipati; the Himalayas; Shri Krishna; the "Vishwaroop"; Durga-Chamundi; the Nrsingh-avatar; Mohini-avatar; Krishna-Arjun; the Varaha-avatar; bull-boar-unicorn seal; Maa Adi-Parashakti; Maa Siddhidatri, Garuda-pillar; how Vishnu-force/energy is depicted; Vishnu-Lakshmi; Jarasandha; Vishnu-Krishna; Chandragupta Maurya from an Indian postage stamp; the Lion Capital of Emperor Ashoka - the second stamp produced in independent India and the first stamp meant for domestic use. 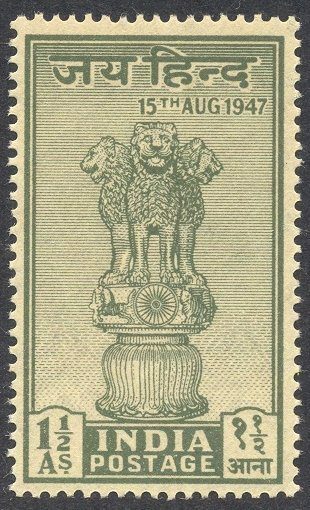 The Government of India issued this stamp (on 15 December 1947); The iron pillar of Delhi, erected by Chandragupta II (Vikramaditya) the Great.